Dromore girl Kerri McDonald has been named in the Ireland squad for the match series against Spain in January. She will travel with Ireland to Valencia for warm weather training before taking on Spain, ranked 14th in the world, in an intense five match series over five days between January 15-19. The young squad, with an average age of 23, will be looking to continue their impressive run under manager Graham Shaw. 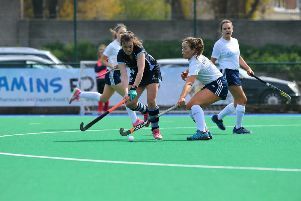 They cruised to victory in the Eurohockey Championships II in July and earn promotion back to the top division in European hockey. Ex-Banbridge Academy pupil Kerri has plenty of experience to draw on. She made her full international debut during that successful EuroHockey campaign earlier this year and has represented Ulster and Ireland at every under age level. She also got a scholarship to the University of Richmond in Virginia earlier in her career. McDonald jetted off the US after finishing her A levels at Banbridge Academy before returning home after two years in America to continue her studies. Kerri helped her club Ards to an historic Ulster double last season before aiding their IHL campaign this term. Talking about the selection and upcoming international series, Ireland manager Graham Shaw said: “We are very excited about bringing this squad to Valencia, Spain in January. “We are a young experienced squad with all our best hockey ahead of us and believe this group of players can have a real impact on world hockey in the coming years. “This camp will be extremely testing with up to three sessions a day combined with the games against Spain.